Composite video cables are usually color-coded yellow (the connector usually has a yellow ring around it, or the rubber boot around the connector is yellow). S-video: In S-video, luminance and chrominance are separated onto two separate signal paths, so the signal can bypass the comb filter in the TV. This usually results in a much clearer picture than composite video, with more defined colors and images. 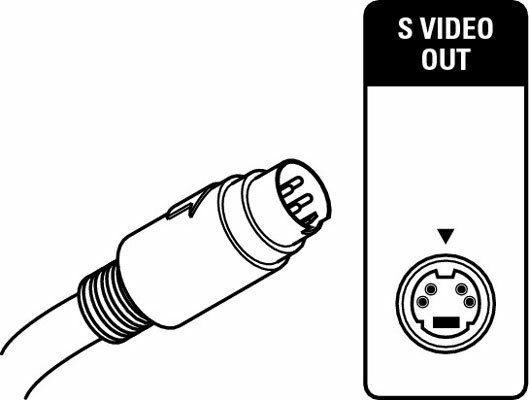 S-video connectors can be a real pain to line up and connect. One set of pins is slightly more widely spaced than the other (the bottom ones are farther apart). Make sure that you align the pins properly when you connect this cable. Align the pins properly when you connect S-video cable. Component video: Component video separates the signal even further than S-video, providing one path for luminance information and two separate paths for chrominance information. Component video connections can be further enhanced in a wideband component video connection, which allows the higher frequencies needed for HDTV to travel from the source (such as an HDTV tuner) to the HDTV monitor. Component video cables are typically color-coded with red, green, and blue connectors. Both component and composite cables use standard RCA connectors and bear a striking resemblance to the analog audio interconnect (and the digital coaxial interconnect). Composite video cables are loners (you need just one), and component video cables travel in small packs of three, often labeled Y, Pr, and Pb.